In the heart of the Toulourenc valley, top Vaucluse, on the edge of the Drome Provencale, in the land of lavender you'll find the small village of Savoillans backed north side of Mont Ventoux. Ideal place for lovers of the great outdoors, hiking, mountain biking, cycling, paragliding etc .. the scenery is spectacular, the absolute quiet. At the exit of the village, surrounded by fields, Celine and Herve have restored an old barn family for years, with the desire to preserve its old charm while using for its renovation and layout of materials and latest equipment .The cry decor is original and refined, like red copper radiators, designed by Céline and made by a local artist heating. This is also thanks to their wanderlust as various objects and decorations found place in the house. Habitation with surprising surfaces, you have a large main room of 70 m² with dining area with a large table and chairs for 8 people, a large central fireplace, and seating area with sofas and flat screen TV LED connected Canalsat. Very bright room with a huge window, 2 Velux, and murderous, overlooking the inner courtyard, this will definitely be a place to live. The house is equipped with broadband internet wi-fi. The large kitchen with its stone walls and its huge central island made of solid walnut, has all the modern amenities (refrigerator US, microwave, large capacity oven, hob, hood etc ...), the dining area offers various views on the village, the mountain or valley through large windows and bays. 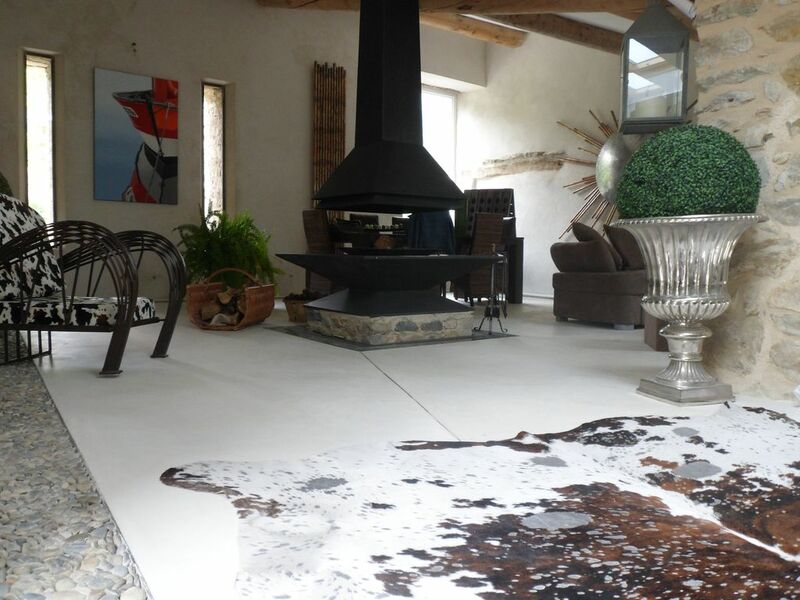 The floors of the house were made with polished concrete decorations rollers Toulourenc. On the ground floor, the room and direct access to the inner courtyard (bedside tables, wardrobe). The toilets opposite the room. The courtyard: fully enclosed, landscaped terrace with modern material and integrated lighting, an old well, without any outside view (60m²) with garden furniture, parasol, sunbathing, barbecue. During the day it will be your intimate space for relaxation, ideal for aperitifs in the evening and the morning breakfasts. Direct access by the room or by a staircase from the 1st floor .From the courtyard you enter the cave where is the washing machine, firewood etc .. A few steps down, the bathroom preceded his dressing room. Featuring a large walk-in shower in local pebbles, double basin in black marble. Piece atypical because vaulted (originally old wine cellar). It will be a great pleasure to welcome you with various welcome touches, and we will not fail to give you all the necessary details about the surroundings. This property is “The Gold Standard” for VRBO. It was my second stay in less than a year - and again I was delighted to be in such perfect surroundings. The host provides all the possible amenities and also offers personal contact to assure the guest is having a wonderful experience. The home is a marvel.. rustic elegance nestled in the beauty of Provence! What can be better?? !!!! Thank you so much for your fidelity and these nice words . A stay in winter is also a nice experience, different,and using the central fireplace a real pleasure . Savoillans, the surrounding villages, and the beauty of the landscape. Thank you. Thank you for your kindness and these nice words . Communicate with you was a real pleasure . We hope to see you soon and wish you all the best for the future . This was our second visit to the enchanting ancient "Bergère" and like before we went back because of the unique charm this house and location has.The remote location is ideal to get away from the hustle and bustle and allows you to de-stress with an abundance of walks and views to die for. The accommodation is like a 5 star hotel and the owner has thought of everything.The décor is very modern inside and the kitchen has a very unique family feel.The fireplace was superb for our cold winter visit and the internet connection was good for all the gadgets that a family has should you want to reconnect with the outside world.Canal Sat is available and the transmissions where easily changed to English with clever VM (version Multi language) Canal sat provides.The decked terrace area looks great and would imagine in hotter periods would be outstanding for barbys. Herve the owner was one of the friendliest owners we have rented from and is very easy to communicate with in French and English. We look forward to our next visit and many thanks Herve! Thank you for your nice words and for sharing your expérience. We are sincerely happy if you enjoyed your stay in our Bergerie, and this nice part of Provence . We really hope to welcome you once again . A unique house in a peaceful, quaint village. Ideally situated for exploring a beautiful area of southern France. Nous avons apprécié notre séjour dans cette jolie bergerie décorée avec beaucoup de goût et surtout très atypique!. La courtoisie et le sérieux du propriétaire s'inquiétant de s'avoir si nous étions bien arrivés et si la location correspondait à nos attentes! Enfin nous le disons , nous recommandons fortement et en toute confiance ce beau produit. Merci beaucoup pour ces termes élogieux , nous sommes heureux que la maison et la région vous aient ravi . Notre souci constant est de se mettre à la place des locataires, de répondre à leurs demandes, d’anticiper . Vraiment, recevoir ce genre de commentaires nous motive encore plus et nous conforte dans notre vision de l’acceuil. Encore mille mercis et nous vous souhaitons un bel été . La bergerie est juste top !!! Propre, au calme a deux pas d une excellente boulangerie et auberge. Merci infiniment pour ces gentils mots , nous vous remercions encore pour votre escale à la Bergerie Truphémus ( qui avait quand même des accents Tourangeaux ) . Inclus dans ces tarifs : taxe de séjour COPAVO , ménage entier de la maison, linge de couchage et de toilette .